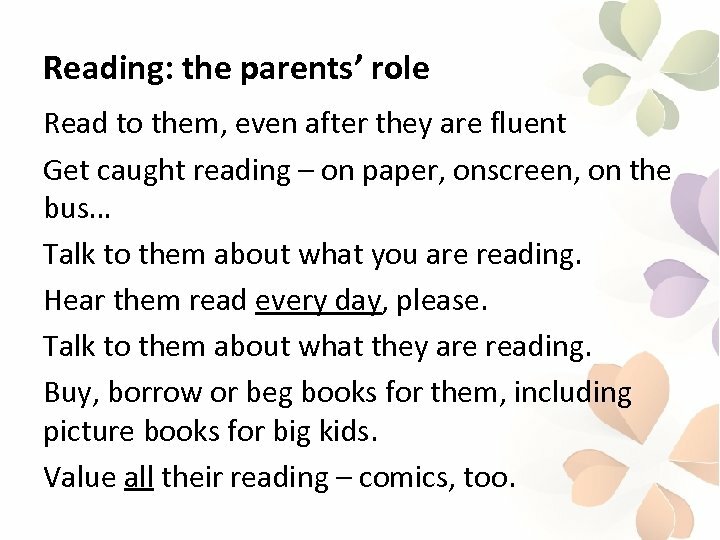 Reading: the parents’ role Read to them, even after they are fluent Get caught reading – on paper, onscreen, on the bus… Talk to them about what you are reading. Hear them read every day, please. Talk to them about what they are reading. Buy, borrow or beg books for them, including picture books for big kids. Value all their reading – comics, too. 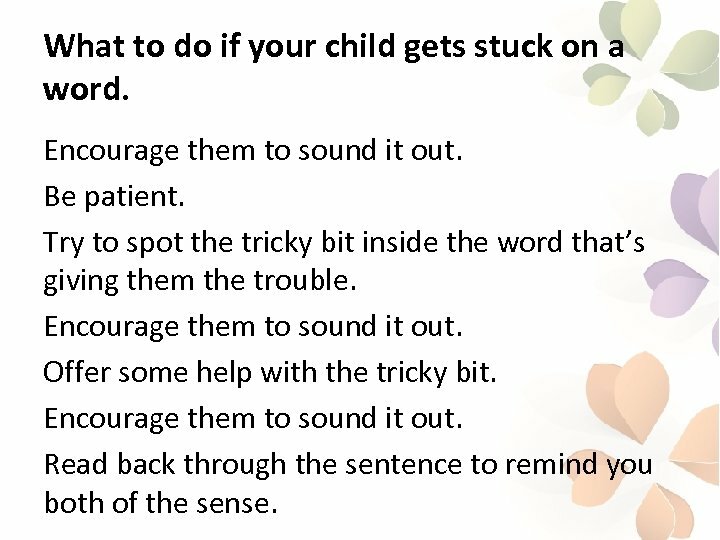 What to do if your child gets stuck on a word. 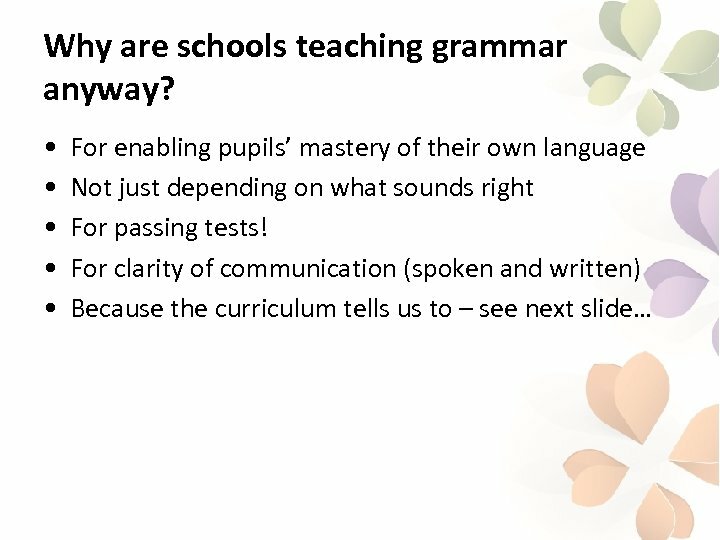 Encourage them to sound it out. Be patient. Try to spot the tricky bit inside the word that’s giving them the trouble. Encourage them to sound it out. Offer some help with the tricky bit. 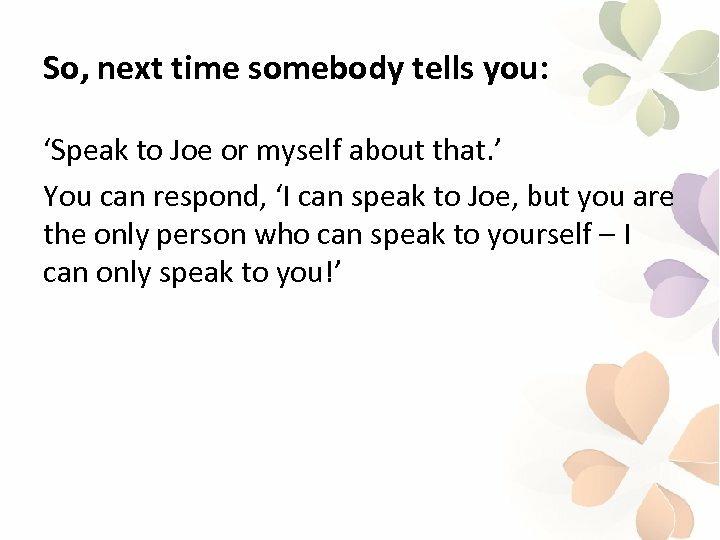 Encourage them to sound it out. Read back through the sentence to remind you both of the sense. 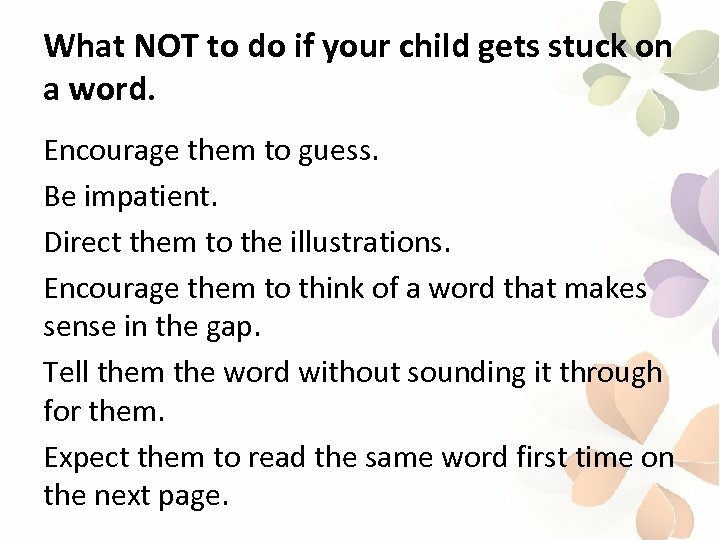 What NOT to do if your child gets stuck on a word. 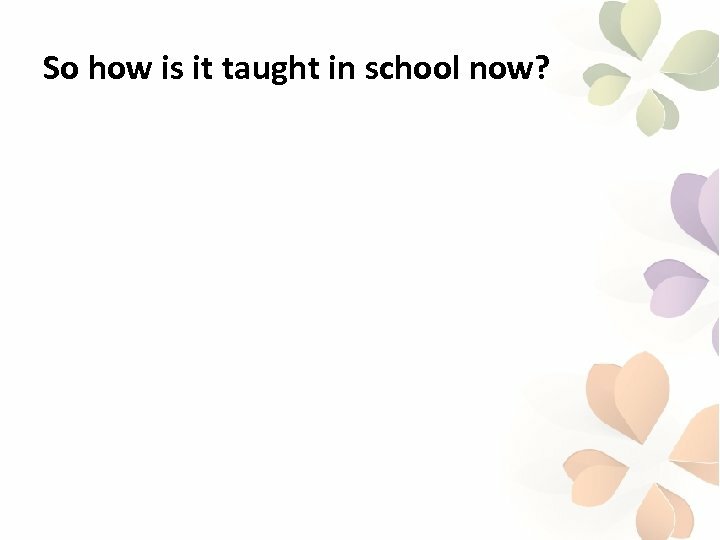 Encourage them to guess. Be impatient. Direct them to the illustrations. 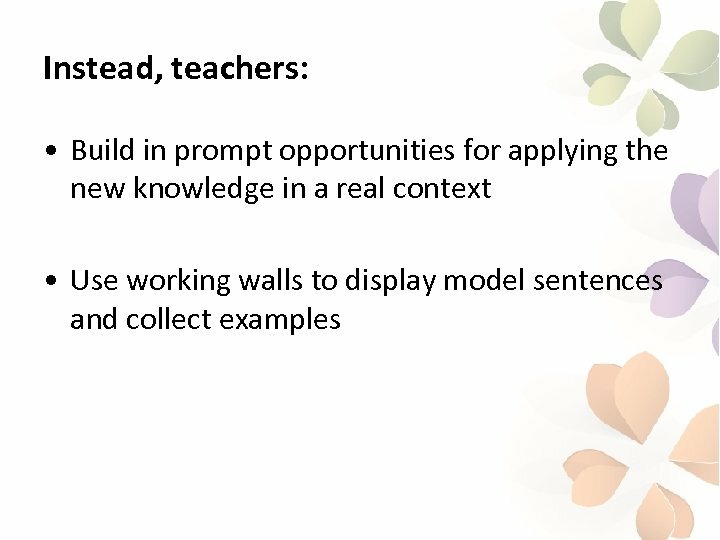 Encourage them to think of a word that makes sense in the gap. Tell them the word without sounding it through for them. Expect them to read the same word first time on the next page. 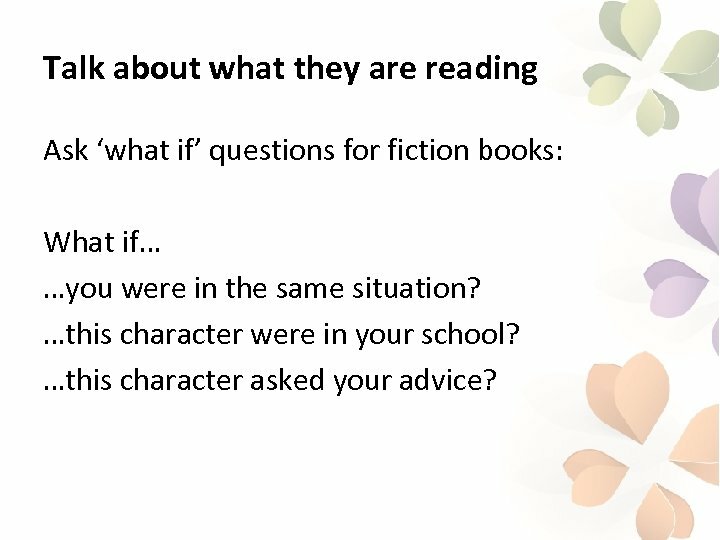 Talk about what they are reading Ask ‘what if’ questions for fiction books: What if… …you were in the same situation? …this character were in your school? …this character asked your advice? 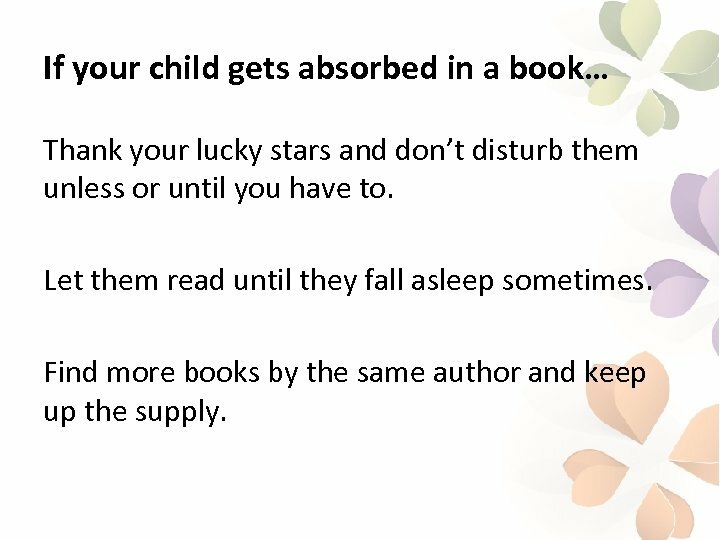 If your child gets absorbed in a book… Thank your lucky stars and don’t disturb them unless or until you have to. Let them read until they fall asleep sometimes. Find more books by the same author and keep up the supply. 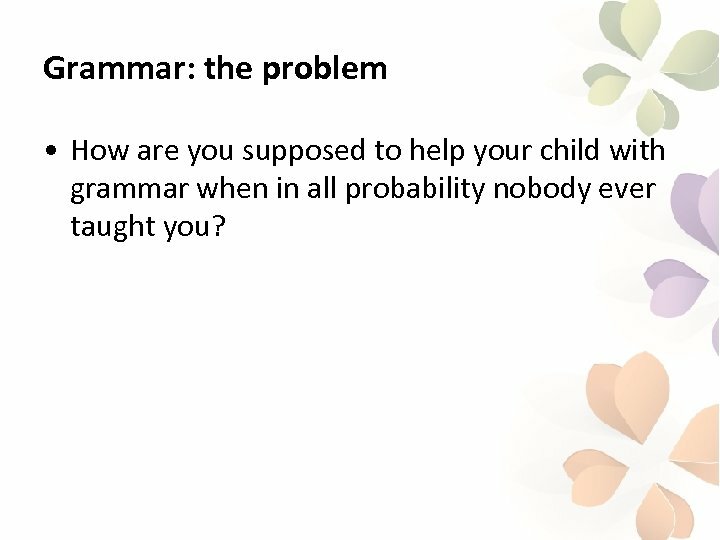 Grammar: the problem • How are you supposed to help your child with grammar when in all probability nobody ever taught you? 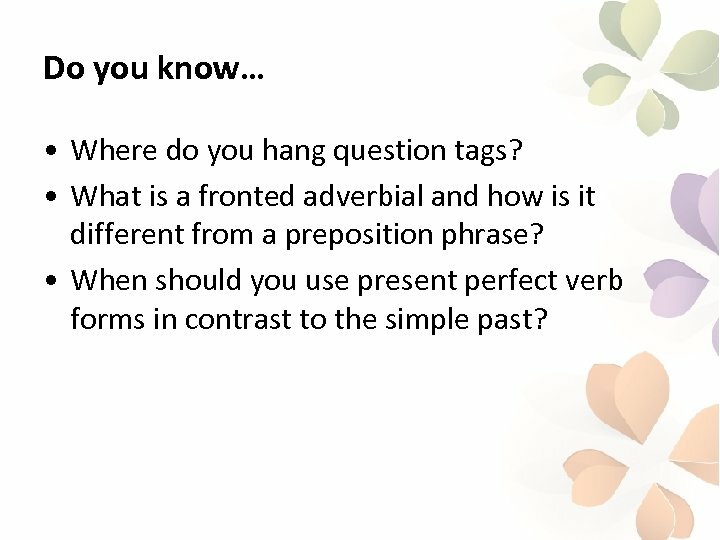 Do you know… • Where do you hang question tags? 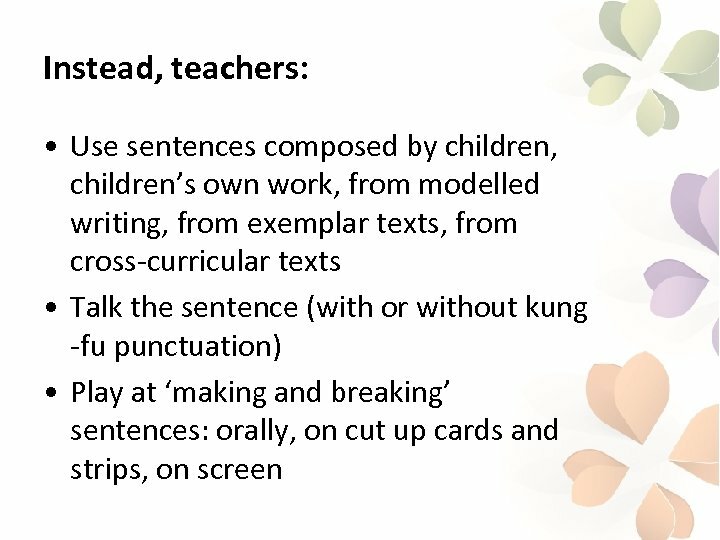 • What is a fronted adverbial and how is it different from a preposition phrase? 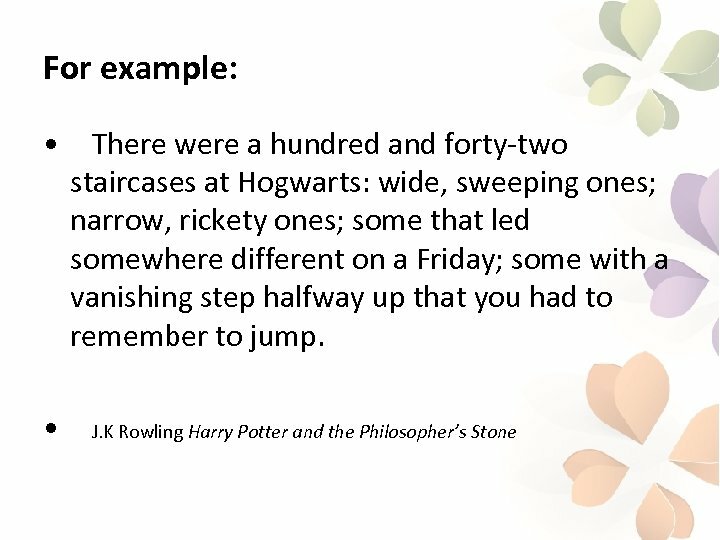 • When should you use present perfect verb forms in contrast to the simple past? 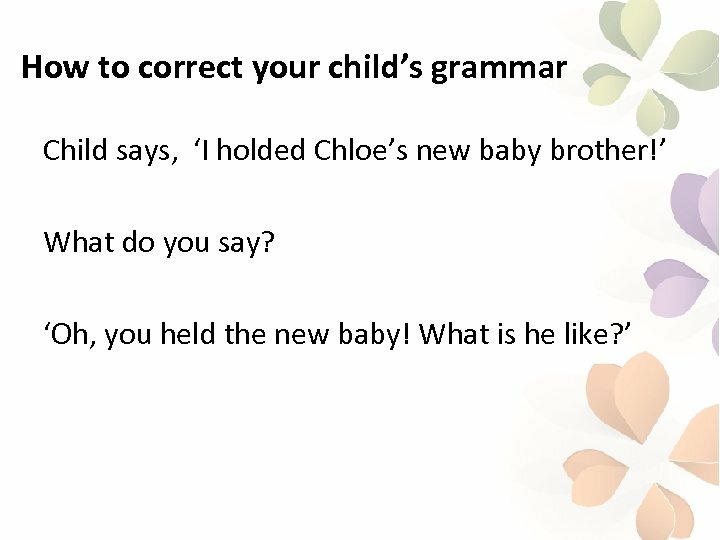 Do you know… • What’s the difference between a relative clause and a subordinate clause and is it possible to be both at the same time if you’re quick enough? 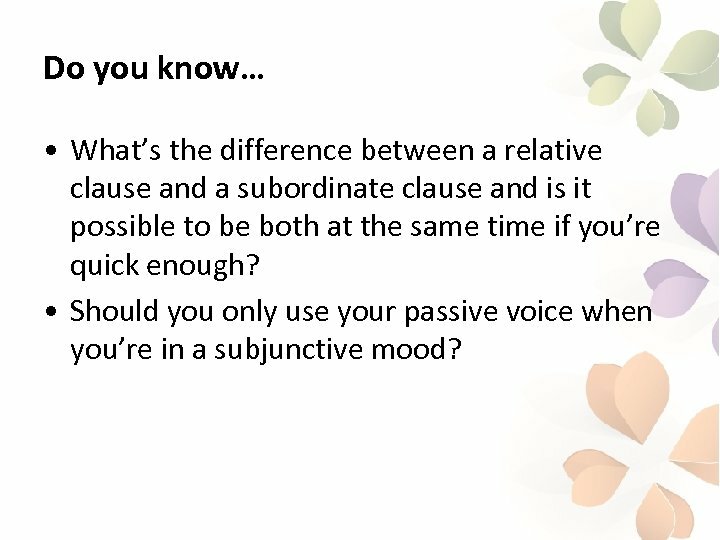 • Should you only use your passive voice when you’re in a subjunctive mood? 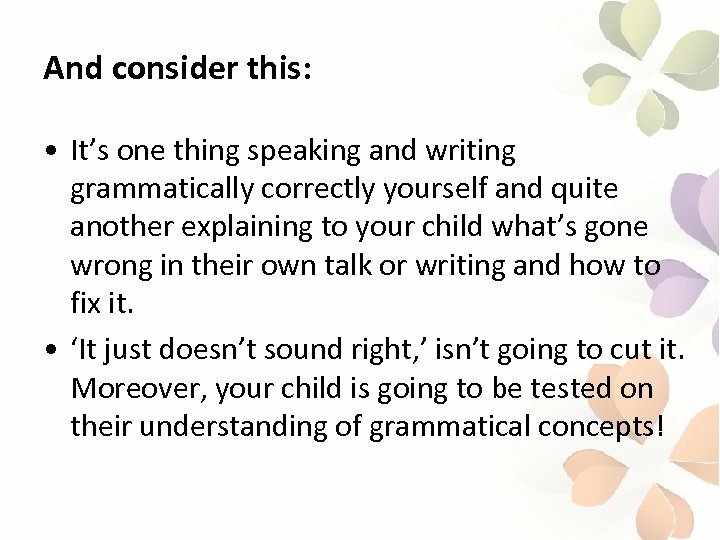 And consider this: • It’s one thing speaking and writing grammatically correctly yourself and quite another explaining to your child what’s gone wrong in their own talk or writing and how to fix it. • ‘It just doesn’t sound right, ’ isn’t going to cut it. 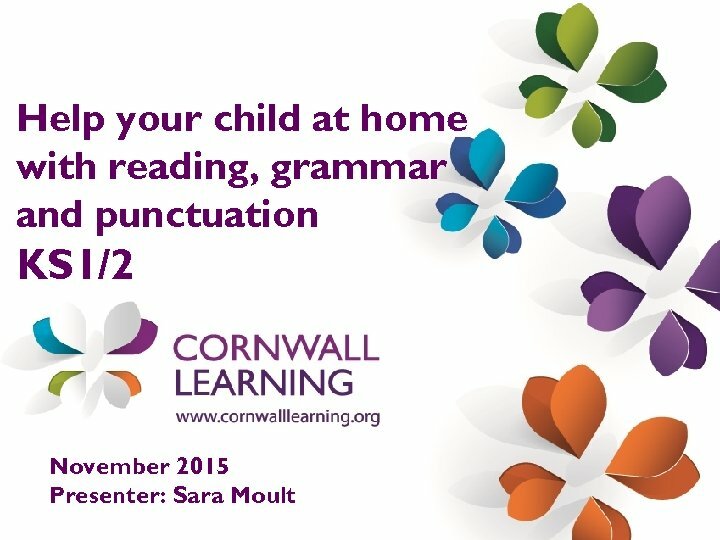 Moreover, your child is going to be tested on their understanding of grammatical concepts! 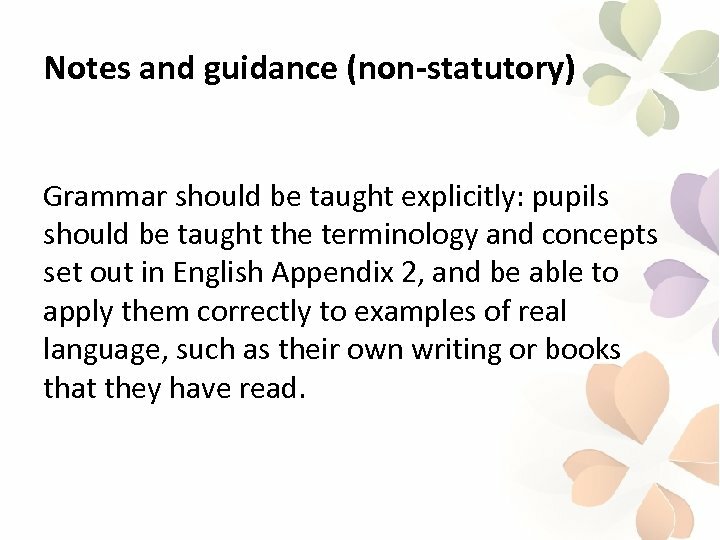 Notes and guidance (non-statutory) Grammar should be taught explicitly: pupils should be taught the terminology and concepts set out in English Appendix 2, and be able to apply them correctly to examples of real language, such as their own writing or books that they have read. 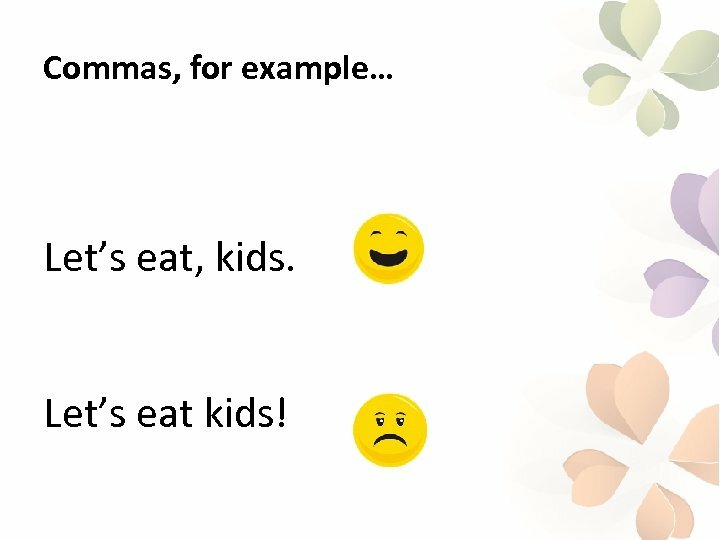 Commas, for example… Let’s eat, kids. Let’s eat kids! 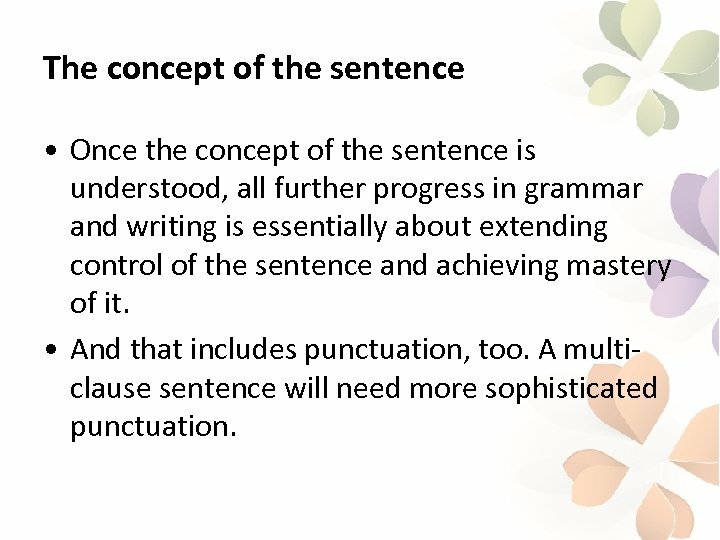 The concept of the sentence • Once the concept of the sentence is understood, all further progress in grammar and writing is essentially about extending control of the sentence and achieving mastery of it. • And that includes punctuation, too. A multiclause sentence will need more sophisticated punctuation. 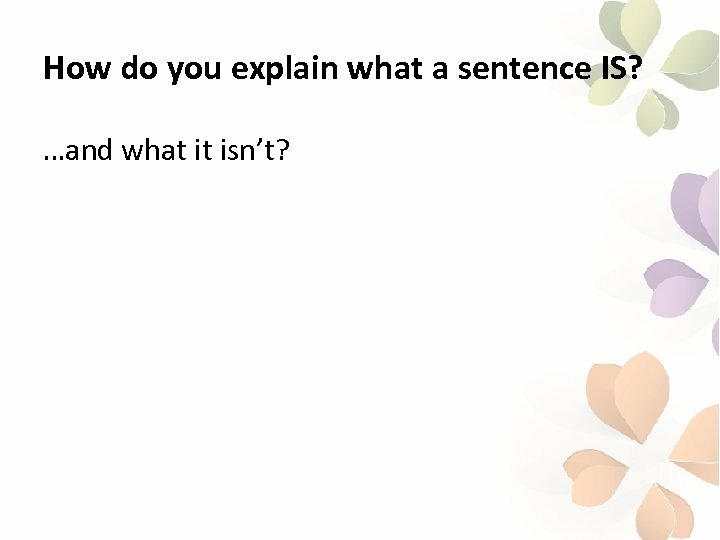 How do you explain what a sentence IS? …and what it isn’t? So how is it taught in school now? 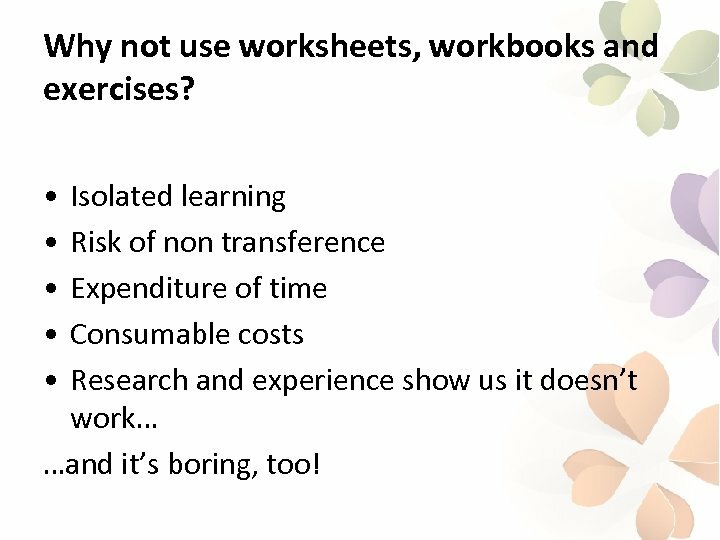 Why not use worksheets, workbooks and exercises? • • • Isolated learning Risk of non transference Expenditure of time Consumable costs Research and experience show us it doesn’t work… …and it’s boring, too! 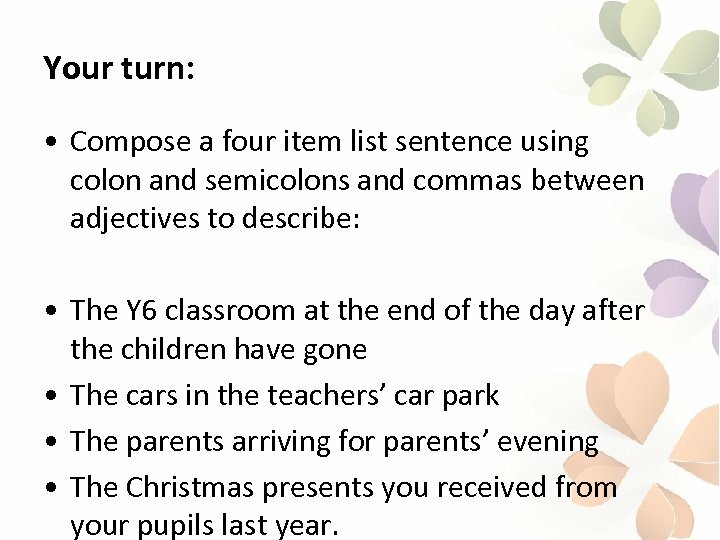 Your turn: • Compose a four item list sentence using colon and semicolons and commas between adjectives to describe: • The Y 6 classroom at the end of the day after the children have gone • The cars in the teachers’ car park • The parents arriving for parents’ evening • The Christmas presents you received from your pupils last year. 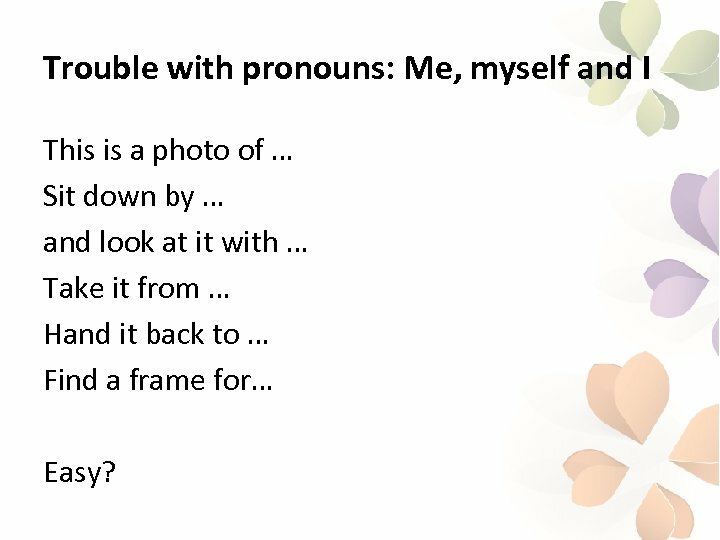 Trouble with pronouns: Me, myself and I This is a photo of … Sit down by … and look at it with … Take it from … Hand it back to … Find a frame for… Easy? 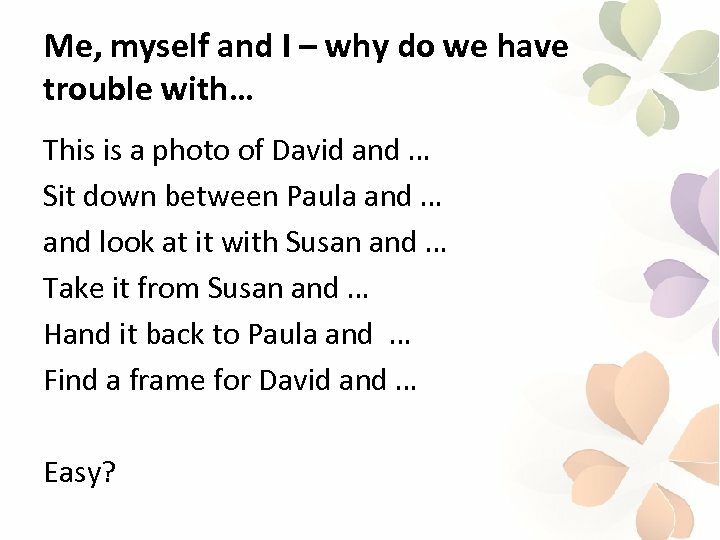 Me, myself and I – why do we have trouble with… This is a photo of David and … Sit down between Paula and … and look at it with Susan and … Take it from Susan and … Hand it back to Paula and … Find a frame for David and … Easy? When is myself the right choice? 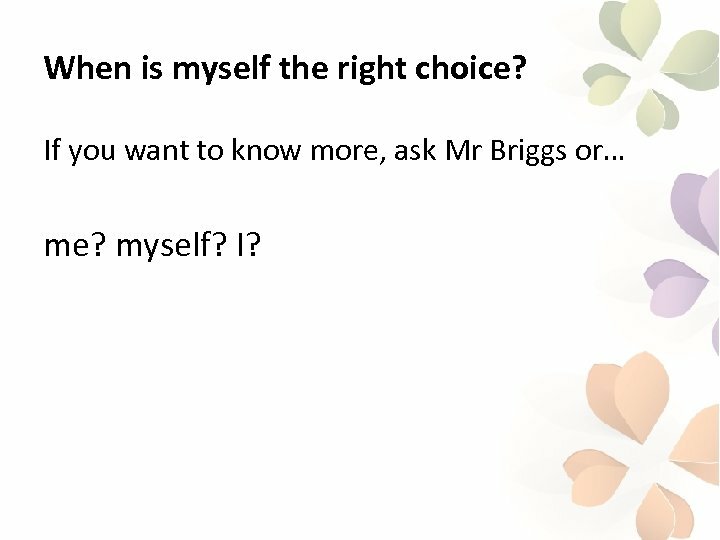 If you want to know more, ask Mr Briggs or… me? myself? 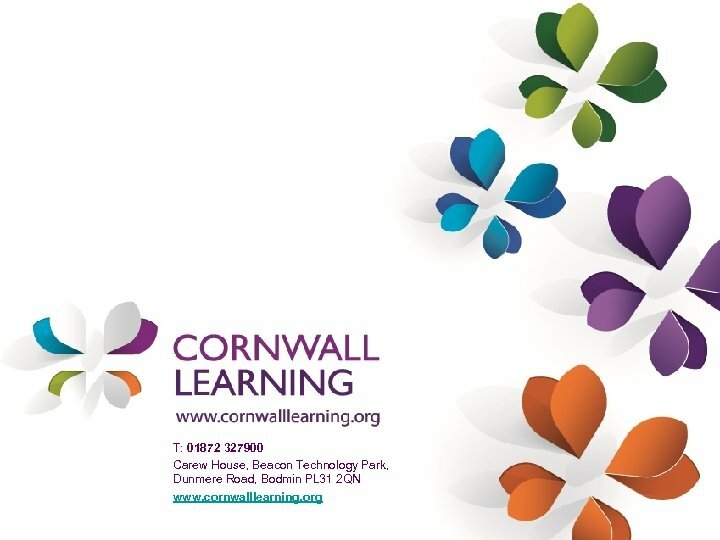 I? 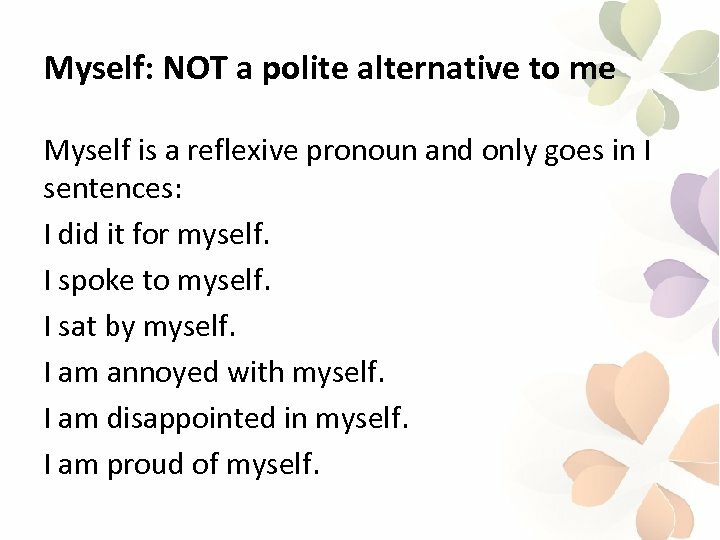 Myself: NOT a polite alternative to me Myself is a reflexive pronoun and only goes in I sentences: I did it for myself. I spoke to myself. I sat by myself. I am annoyed with myself. I am disappointed in myself. I am proud of myself.